Canon has announced a new ultra slim photo printer called Canon Selphy CP810. This printer is a follow up to their CP800 model. United Kingdom, Republic of Ireland, 7th February 2012 – Canon today unveils its new SELPHY compact photo printer, the SELPHY CP810, designed to make photo-lab quality printing on the move, or at home, quick and easy. Replacing the SELPHY CP800, the new model offers a number of improvements, boasting a slimmer, compact and more portable design, expanded creative features and improved usability. The SELPHY CP810 is ideal for those looking for a convenient printer that delivers high quality prints in less than a minute (Applicable to postcard size-printing). The lightweight, portable design also provides a suitable option for business users who want to offer on-the-spot ID Photos or instant photo printing services. Photos can be printed directly from a range of compatible memory cards, or from any PictBridge-compatible device, such as a camera or camcorder. The SELPHY CP810 can also print from USB flash memory sticks or from mobile phones via the integrated USB port, enabling instant output without the need for a computer. For enhanced viewing and operation, a tilting 6.8 cm (2.7”) colour LCD screen features at the heart of the SELPHY CP810 operation. With support for 13 languages, images can be viewed easily and printed with a simple press of a button. To produce the best prints, the improved Auto Image Optimizer function increases the quality of the print output compared to the quality of the original digital image, recognising scenes and improving the subject by making specific adjustments – for example controlling the brightness or contrast. In addition, a selectable Smooth Skin effect evens out skin blemishes for more flattering portraits, and manual brightness adjustment can be applied to fine-tune the prints produced. By using dye sublimation technology, the SELPHY CP810 gives images superb depth and gradation of colour, providing a similar look and feel to traditional photo lab prints without the wait. Prints are dry and ready for handling the second they leave the printer, resistant to scratches, spills and fading. The SELPHY CP810 is capable of producing postcard (148 x 100mm), L (119 x 89mm), and credit card (86 x 54mm) sized prints in super-quick time, on a range of Canon photographic media. The SELPHY CP810 also offers a range of image layout options, including the ID Photo layout which enables users to print a range of standard or custom-sized ID Photo images on a single sheet of paper. The SELPHY CP810 offers portable printing and has an optional NB-CP2L battery pack, giving the ability to print instantly whilst on the move. Ensuring that the printer is only portable when needed, a security cable, such as a Kensington lock, can also be attached to the added security slot on the printer body, while an optional Dust Protection Cover protects the printer and consumables when operating in dusty environments. Owners of the new Canon SELPHY CP810 can also join the newly updated CANON iMAGE GATEWAY, an online facility for sharing photos and video, now providing up to 10 GB of personal storage capacity, perfect for storing many photos, even in full resolution. An easy interface allows users to search for images, create combined photo and movie Albums that can receive comments from friends, and to share Albums directly via email and Social Networking Sites. The SELPHY CP810 is available from May 2012, priced at £99.00/€109.00 RRP incl. VAT. 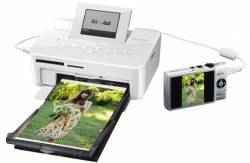 Canon has announced a new All-in-One printer called Canon Pixma MG4150 that is web-enabled. 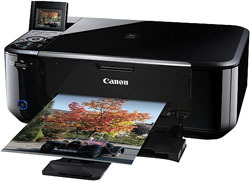 The Canon printer is able to print up to 9.9 images per minute, or so Canon claims. The Canon Pixma MG4150 printer will be available in March 2012 and cost about £119/€139. United Kingdom, Republic of Ireland, 1st February 2012 – Canon today announces a new compact, web-enabled, All-in-One printer packed with clever features to suit students or families looking for an affordable, quality printer with the latest web features. The PIXMA MG4150 comes in a stylish black design with enhanced functionality and connectivity features to make printing from smartphones and tablets easier than ever before. 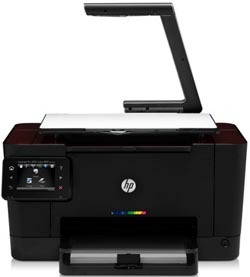 The MG4150 also features duplex printing functionality and environmentally responsible design features, as well as a range of smart software to enable users to get the most out of their printed documents and photos. Thanks to integrated Wi-Fi capabilities, the MG4150 can scan and copy from virtually anywhere in the home. With Canon’s Easy Photo-Print App, PC-free printing and scanning and wireless mobile printing from iOS™ or Android™ devices is also quick and easy. With direct access to the cloud, users can even print their favourite photos stored on online albums, including CANON iMAGE GATEWAY and Picasa Web Albums, using Online Album Photo Print via the PIXMA Cloud Link. The time saving MG4150 also includes a range of print-ready templates, including calendars, envelopes, stationery, memos and other useful resources, which are all available at the touch of a button with Web Template Print. Printing premium quality documents and photos at home is fast with the new MG4150; a quality 10x15cm borderless photo, printed in default mode, is produced in approximately 44 seconds, with ISO speeds of 9.9ipm for black and white documents and 5.7ipm for colour. For frequent users, Canon FINE ink cartridges now come in a high yield XL size offering up to 50% cost per page savings over standard tanks (based on Canon RSP, compared to equivalent non XL Canon cartridge, using ISO/IEC24712 page yield). The models are ideal for both text documents and photo printing; FINE print head technology with a minimum 2pl droplet size, combined with maximum 4800dpi print resolution, produces beautiful photo prints and crisp word documents. The MG4150 also features a 6.0cm LCD display for easy operation and comes with Auto Duplex Print allowing for automatic printing on both sides of the page for greater efficiency. The MG4150’s smart design and eco settings also mark it out from the crowd. A stylish high-gloss look and compact design makes the MG4150 fit into the most stylish of homes. Canon’s FastFront design allows paper and ink cartridges to be loaded into the front of the printer, so it can be placed against a wall or on a shelf, saving valuable space. For eco-conscious users, the new ECO Setting monitors paper and CO2 reductions and demonstrates the savings made by using the Auto Duplex mode. The Auto Power Off feature ensures the main power can be automatically turned off after a set time to save energy, whilst the Quick Start function allows the MG4150 to power up again quickly, for on-demand printing. The new MG4150 comes with a range of software solutions for smart printing that will appeal to those looking for the very latest features. A comprehensive suite of intuitive software for photo and document printing and scanning comes as standard. For example, for keen photographers, Auto Photo Fix II software uses Face Detection and Scene Analysis technology to remove common flaws for great looking prints every time. When used with Canon genuine inks, the MG4150 comes with access to CREATIVE PARK and CREATIVE PARK PREMIUM, a fantastic free resource for printing cards, printable crafts and calendars. It also includes access to exclusive imagery and artwork from famous artists and photographers. Easy-WebPrint EX (With Internet Explorer 7, 8 and 9 (for Windows) prints web pages exactly as required which means wasting paper or ink when printing from the internet is a thing of the past. The intuitive software means multiple web pages can be combined and printed on one page using Auto Clip or the one click fit-to-page option, offering truly intelligent printing from the web. Easy-PhotoPrint EX software means users can impress friends and family and get creative with content – printing photos, calendars and albums. With new Fun Filter Effect, apply fun and artistic image effects to prints including Blur Background, Fish-eye, Soft Focus, Miniature and Toy Camera. HD Movie stills can be captured and printed from full HD video footage shot on Canon’s range of Digital SLRs or Canon Digital Still Cameras. Multiple images can be combined to give a sense of motion to the printed photos with Merge Frames, while Layout Print lets users select a small movie clip and use a comic-strip effect to print a storyboard. The PIXMA MG4150 is available from March 2012, priced at £119.00/€139.00 RRP incl. VAT. Trusted Reviews has tested a portable scanner from Fujitsu. 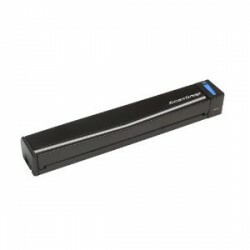 The scanner is called Fujitsu ScanSnap S1100 and measures only 273 x 48 x 34mm. Trusted Reviews ends up giving the ScanSnap S1100 an overall score of 8 out of 10 possible points. The mobile scanner scores highest on scan speeds, scan quality and features, while it scores a little bit lower on value for your hard earned money. On the positive side the reviewer finds the software that comes with this scanner to be good, it scans in high resolution and the quality of photo scans are pretty good. There are a few negative points keeping it from getting a top score including that it is not able to scan from books or magazines and you do not get a case for the scanner. Read the full review of the Fujitsu ScanSnap S1100 mobile scanner here.